Despite what their name might suggest, Bacon caramels actually have a subtle bacon taste since the recipe does not call for any actual bacon in it. Rather, they are made with bacon fat instead of butter, so they have a slight undertone of a smoky, savory flavor. Of course, you can always top them with some crumbled bacon to boost the pork factor! Since this recipe calls for bacon fat, it's a great way to use up some of the excess fat that can be left from other bacon recipes, like chocolate-covered bacon or bacon caramel corn. In a medium saucepan, combine the salt, granulated sugar, light corn syrup, and water. Make sure your pan leaves enough room for the mixture to approximately quadruple in size. Place the pan over medium-high heat and stir until the sugar dissolves. Once the sugar dissolves, insert the candy thermometer and cook the mixture, without stirring, until it reaches 330 F (165 C) on the candy thermometer. It should be a medium amber color and fragrant when it is ready. While you wait for the caramel to cook, combine the heavy cream and the bacon fat in a small saucepan and place it over medium heat until it just reaches a simmer. Once simmering, take it off the heat and set it aside for now. When the sugar has caramelized and reached 330 on the thermometer, begin whisking it and slowly drizzle in the hot cream mixture. It will steam and splutter quite a bit, so be careful to avoid burns. Once all of the cream is incorporated, continue to cook the caramel, stirring frequently, until it reaches 255 F (123 C) on the thermometer. Pour the caramel into the prepared pan. Let it sit for a few minutes, then while it is still warm, sprinkle the top with flaked sea salt or crumbled bacon (or a combination of both), if you desire. Let the caramel cool completely at room temperature, for at least 4 hours or overnight. Once set, remove the caramel from the pan using the foil as handles. Peel the foil off the back. Use a large sharp knife to cut it into small squares. For easiest storage, wrap each individual caramel in waxed paper or parchment paper. 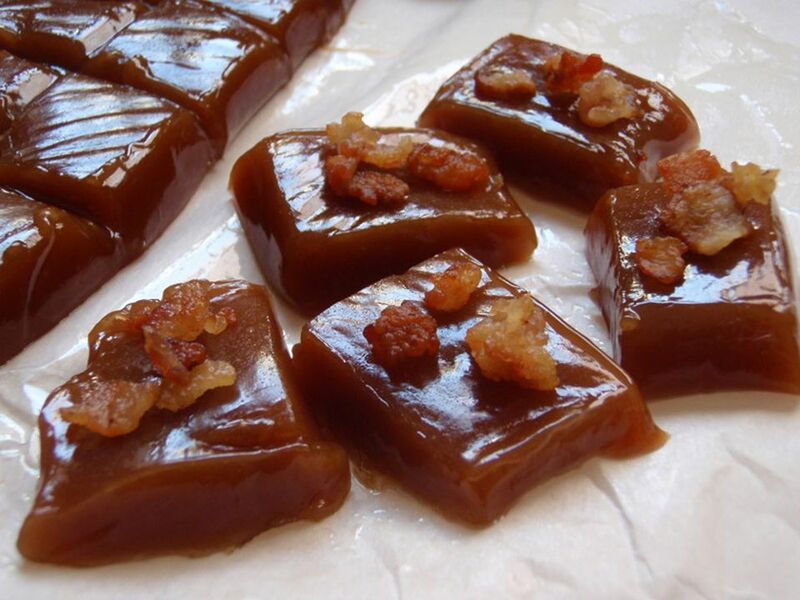 Store individually wrapped bacon caramels in an airtight container or bag at room temperature for up to two weeks.